How do I get the room colder? | Flickr - Photo Sharing! This is a snowflake. in sweeden it means being cool. in NEW MEXICO, it means being under 6 feet of snow. How do I get the room colder? Sun? 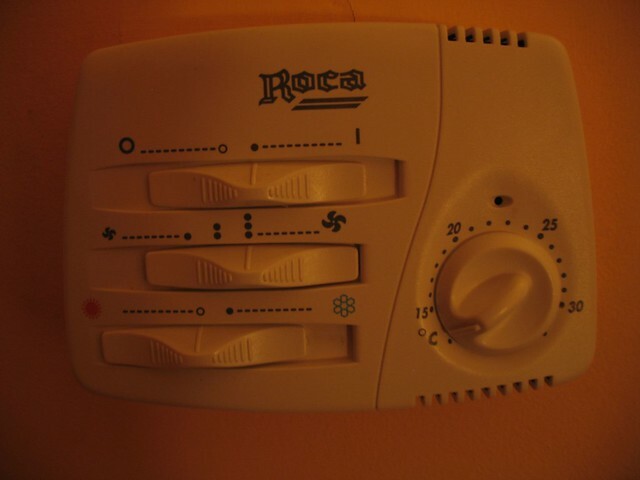 It looks like a (badly drawn) snowflake to me, the virtually universal symbol of A/C. The one to the left (hard to see), the red one, is a sun. Wow, that is surprisingly nonintuitive. Red is HOT and Blue is COLD the same as water taps! Usually they are, yes. Not in this case though as I wrote above. It wasn't miswired. When I was in the Mid-East last year on business(Army), the guys and I were confused too. All of our AC/heating units were labeled that way. It's just a non-North American way of marking it. It's marked for the weather, not what you want it to be. Aha! Maybe it's not broken then! Your notes are broken. Why did you refer to Spain and New Mexico (in addition to Sweden of course) while talking about only one A/C control? I was referring to only one A/C control since that was the only one I got "hands on" with in Spain. And I posted the image to get some comments, to see if it really was broken, or if we have different symbols for different regions (which looks to be the case).